Find out about asbestos, what it is, and why it is such a hazardous material. Asbestos is the common name for a variety of naturally-occurring silicate minerals that are fibrous in structure. These minerals occur in many parts of the world – the main areas of commercial asbestos mining and production are in Canada, the Soviet Union and Southern Africa. Asbestos-containing rock is crushed and milled at the mining site to produce various grades of raw asbestos. Asbestos fibre is mechanically strong, and highly-resistant to heat and chemical attack. Due to its fibrous nature, asbestos can be woven into fabrics and used as reinforcement for cement and plastics. There are six types of asbestos which fall into two fibre categories. The two asbestos fibre categories are: Serpentine (curly, wavy fibres) and Amphibole (needle-like fibres). Of the six types of asbestos, the three most commercially-used are: Chrysotile (White Asbestos – Serpentine), Amosite (Brown Asbestos – Amphibole) and Crocidolite (Blue Asbestos – Amphibole). 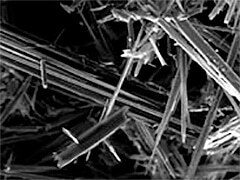 The other three types of asbestos are all Amphibole fibre types, and are far less common. These are; Anthophylite Asbestos, Tremolite Asbestos and Actinolite Asbestos. 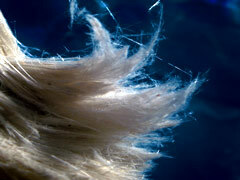 Asbestos strands can be split into smaller, thinner fibres if disturbed. Asbestos mined ore will initially divide into visible strands, fibre bundles, and individual fibres. This splitting can continue to minute levels of microscopic size. This process is unique to asbestos, and explains why airborne asbestos is such a problem. Asbestos fibres can become so small that they remain airborne longer, and pass undetected by human respiratory dust defences.